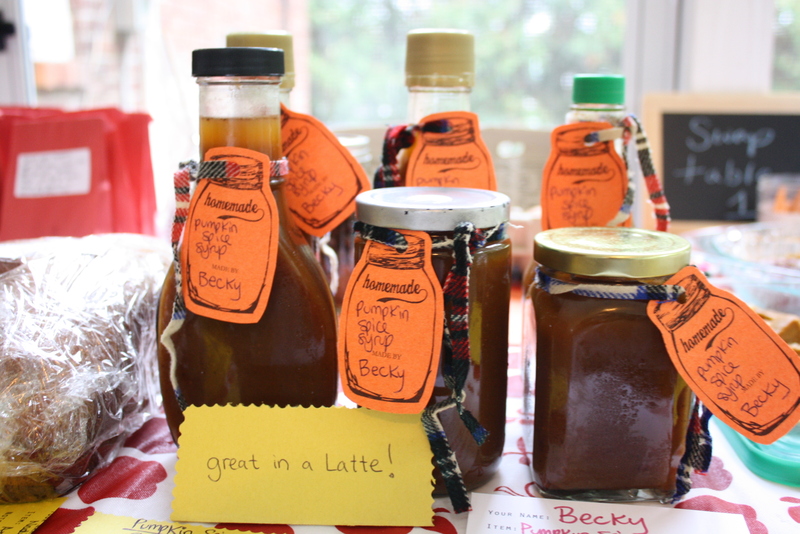 Our food swaps, FSC Swappers, is a place where home cooks, gardeners, forgers, food preservationists, DIY enthusiasts and bakers come to swap their homemade edible food & drink products and garden bounty. 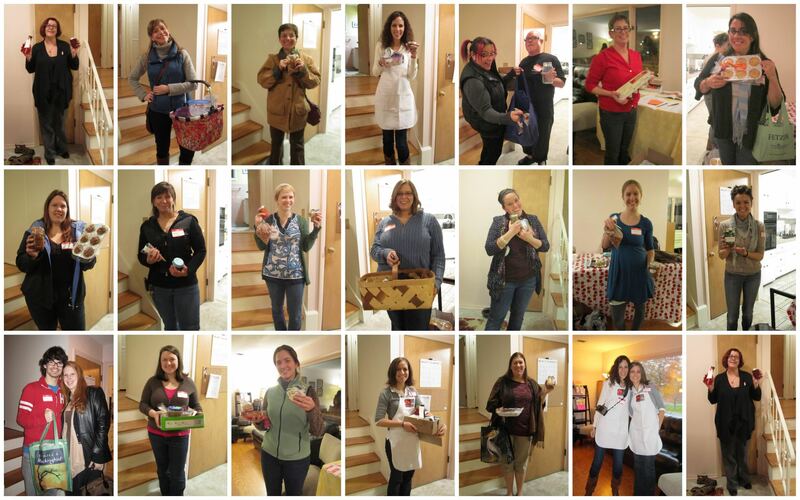 Participants come from all over the Capital Region, Hudson Valley and North County to sample items, get inspired, make new friends and of course, swap loot! No money, just great food, is exchanged. 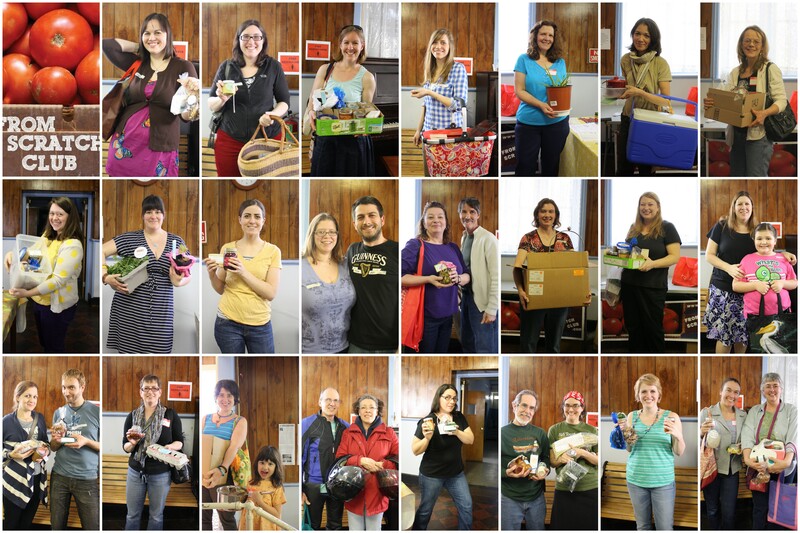 As of January 2014, we organize one swap each month in Saratoga Springs at Healthy Living Market & Cafe and four times a year in Troy (Oakwood Community Center, 313 Tenth Street, Troy, NY) or Albany at Honest Weight Food Coop. We began our food swaps in April 2011. We ask that all Swappers or Swap Curious attendees to sign-up for a free ticket on Eventbrite. To read more, click on the link “swaps” on the top right to read more. “Like” our swap page on Facebook for announcements on tickets. 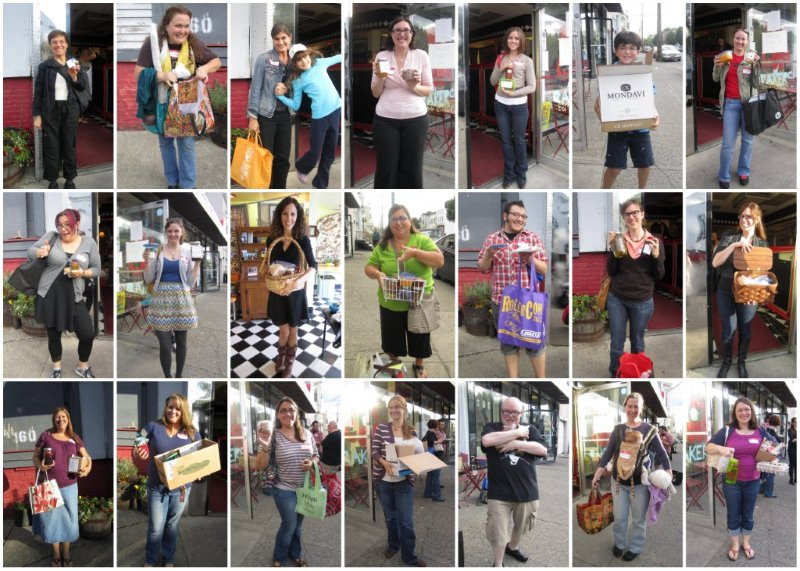 Our food swap is a place where you can trade an item you made for another item that someone else made: items are swapped 1-for-1. You bring as many or as little items as you’d like to trade; you can bring 1-infinity of one good (X loaves of breads) or X different items (1 jar of blueberry jam, 1 loaf of bread, 1 jar of vanilla extract, 1 tomato transplant, 1 jar of granola. 2 pints of pickled beets and one jar of mustard, ect ,ect). Just remember that items are swapped 1-for-1 (THIS MEANS NO BARTERING. Each Swapper sets what “one item” is: 1 pint, 1/2 pint, 1 bag, 1 quart container, 1 cake, 4 muffins, 6 cupcakes or cookies, ect, ect. This makes the swap VERY Friendly & FAIR). You will place the items on one of the tables, grouped by item so that guests will view the goodies and write their names down if they are interested in trading with you. They will also be required to tell you what they want to swap for your item. Then the last 30-45 minutes of the event will be the “live action swap” where you will look on your sheet(s) to see who wants to swap with you. Then you will find those people, if you want to swap with them, based on their name tags or knowing them personally already, and starting a conversation with them: “Do you wanna swap” “sure” “great””let’s do it”…. or if you don’t want what they are offering, kindly decline and move on. PLEASE NOTE: The ‘swap cards’ are only a starting place, you do not have to swap with people on your cards or ones you’ve signed up for- Please make sure each swap it done FACE TO FACE with the other person agreeing to the swap! 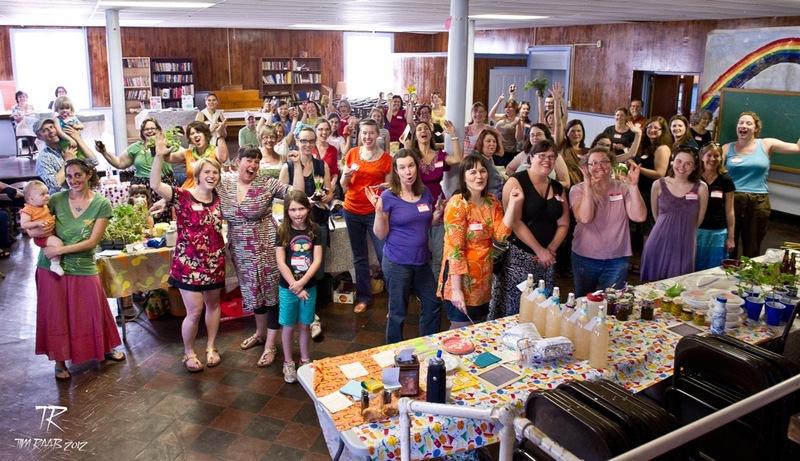 Have you been to a swap yet? If not, find a swap in your area and sign-up because you are missing out on, yes the food, but more importantly the blossoming of community that’s being fostered. Of course, if you’re competitive like me, you’ll want to go for the rush of excitement when its “Open Swap Time”. Ohhh the rush! As the hostess, most of the time I spend running around making sure swappers have enough table space, explaining the swap process. But in between the madness, I stop and watch the scene: vibrant, alive, loud, excited, sincere, animated. Laughing, sharing, joking, drinking, eating and hugging. Gardeners, homeschoolers, vegetarians, Celiac’s & the food allergic, DIYers, backyard farmers, vegans, hobby farmers, foodies, local/fair food advocates and foragers have a place to meet, share stories, tips and email addresses to foster friendships. A Community is sprouting, friendships are being made. Food truly brings people together: Community. Between our two swaps a month, Troy & Saratoga Springs or Schenectady, we have over 75 swappers every month who bring everything from hard cider, herbs, radishes and greens from their gardens to tomato transplants, dried herbs, vanilla extract, kombucha SCOBIES, vegan cookies, craft home brew, infused vodkas, chicken stock, pies, jams, compotes, date puree, cheesy bread, garlic scape/white bean spread, pitas with hummus and garlic scape tzaziki, water grain kerif, teas, lip balm, home-roasted coffees and more! First on the scene was Amy Halloran who wrote a piece on us for The Metroland, Fair Trade, in August 17, 2011. Tyler Murphy wrote a lovely 2-page full color spread on us for the Times Union’s Life @Home Magazine on October 24th, 2011. We just had a lovely Food Section Cover Story for the Times Union, March 23rd, ‘Their Own Food Network’ is the terrific title of an article written by Staff Reporter Leigh Hornbeck. 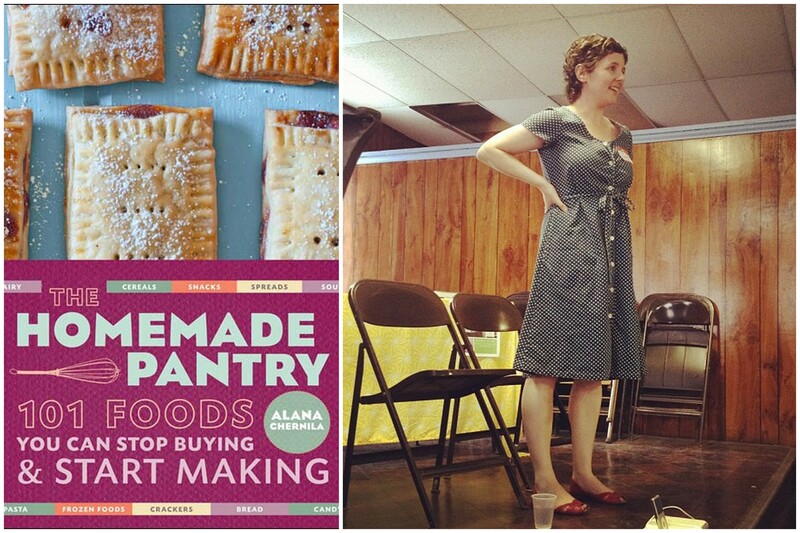 Alana Chernila, author of The Homemade Pantry, giving an author’s talk at the April 2012 Troy Food Swap. Ventura County Star on VC Swapper’s events: Food swap helps people share produce or homemade goods. Portland, OR has something extra happening at their swaps: Portland singles meet kindred spirits at food swaps Article from Oregon Live. “Let’s Make a Deal” Sun Sentinal covers Fort Lauderdale’s growing food swap scene! 9News Denver covered the MilesHighSwappers on the TV. cool. One of the biggest articles to come out in recent weeks is The Boston Globe’s story: For swappers, it’s share and share alike. With a video component. 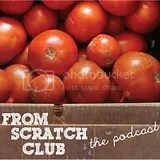 Megan Paska on Huffington Post on how she & FSC’s favorite Hip Girl, Kate Payne, created their first food swap. Cooking Up a Story featured the PDXSwappers in a video piece. Shareable.Net also had a story on California, food safety regulations and food swaps. An article on “hosting your own food swap” published in the July/August Eating Well magazine. Gotta love twitter! 1) Wait a swap or two to bring “seasonal” fruit-stuffs. Meaning, if strawberry & rhubarb are currently in season, wait a swap or two before bringing your jam to swap because a great percentage of items (muffins, cakes, pies) will contain those fruits. This might mean that its less likely someone will find your jam appealing. Upon looking at your amazing jam, a swapper might think to themselves: “Oh, I’ll grab some rhubarb & strawberries at Saturday’s market and make some this weekend“. But if the fruits are already out of season, whoa, people will be more likely to want it. 2) Know you audience. I brought a few quart containers of chicken stock thinking they would be a hit. FAIL. I mean serious FAIL. Not one personal wanted it, who had stuff left to swap. I begged & pleaded at the end of the night to a resounding “no thanks” and “I’d love to but I have a freezer full of the stuff“. HA! What I’ve learned is this; people going to our food swap in Saratoga Springs probably make their own stock with the bones of their own meat chickens or from a chicken purchased at the farmers market. That said, chicken stock might be a hit at our new Albany Swap (I’ll let you know, as I’ll try again). So don’t be afraid to bring something, just know you might be taking it back home- which was fine with me. I can always use GF, allergen-free chicken stock. 3) Have samples. If people can sample your spread/dip/jam/dilly green beans; they are more likely to want to swap for it. The unknown food product is sometimes scary. 5) Even though some swappers aren’t gonna want to hear this: Cutesy labels are attractive and win votes. Also recipe cards for the item is also a big plus. People that come to a swap like to create in the kitchen, if they like it, they will want to make it. 6) My last suggestion is this: Please make a list of all ingredients on your label or take home recipe card. Of course, I assume all items at the swap are unsafe for Miles, so everything except for canned veg & jams, I eat only with Chuck. This last suggestion isn’t so much about food safety but transparency. People wanna know what they are eating. Period. Lastly, you can find all of our blog posts on our food swaps —-> HERE! contain the discipline to attain a small waistline through exercise and proper diet.